Needed to rename this place… I didn’t quite feel at home here. So goodbye My Connectivism Blog and hello Cybergarden. Why Cybergarden? I already have a Cyberattic and a Cyberkitchen so Cybergarden seems like an appropriate name for a place for reflecting. I also have a classblog – am thinking of renaming it Cybermill (never took the time to think of a name, temporarily titled it Roštilj first (there’s a story) and EFL Blog later, when the Roštilj student generation finished class. Never liked the EFL blog name, sounds empty…Cybermill would at least make it consistent with the rest of my cyber spots. Not sure this will encourage me to start blogging more regularly, but at least I will feel more at home when I do. 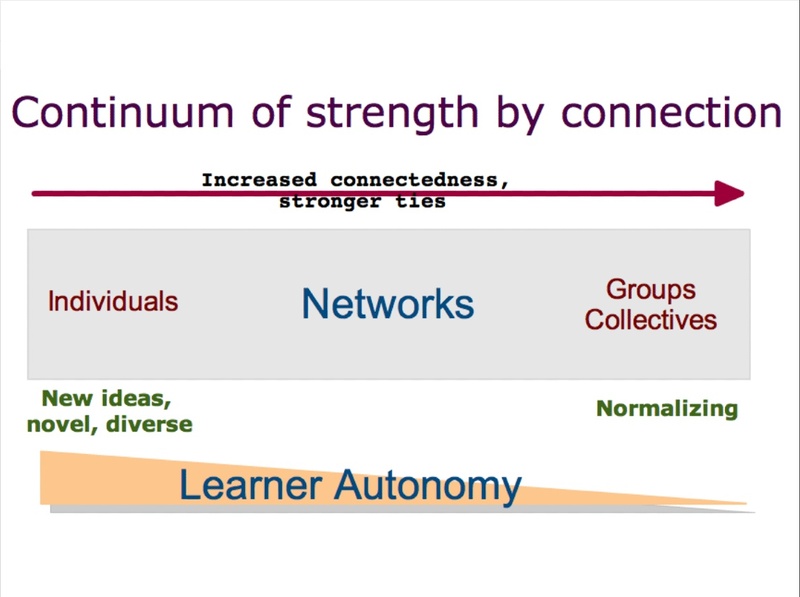 Liked this slide from George Siemens’ week 5 presentation Group and Network, it maps together some of my ramblings from my previous post in a more clear picture; the individual vs. group approach to learning are shown not as alternatives but as extreme positions along a continuum; the former allowing for maximum learner autonomy, the latter minimum. So befitting the situation a learner/course organizer needs to find the optimal position along the line. Enjoyed the course so far. The idea of the need for reconsideration of a learning theory resonates with me. Being a teacher today, I feel the need to find a way to teach differently than I was taught. Kids today don’t seem to be the way generations before were… They know more and dare more, they question, comment, openly show disagreement, correct when they know better… Not all of them, but some do. I can’t expect to be listened to simply because I am a teacher (i.e. finished a university programme, which made me fully qualified but not quite prepared for the teaching reality). Lots of theory, little practice or modeling to stick to from my university days… still remember well one of my university profs rewarding generously students who cited word by word paragraphs from his book (the only required course reading, which included a paragraph stating we should not ask kids to learn stuff by heart). Such is life, isn’t it? There are things that make sense and things that don’t but you put up with, because at the time it’s simplest that way. Urgently feeling the need for better examples of good teaching practice , I went on the net, … and looking back I believe it was then that my real professional development began – when I took MY learning in MY hands. It definitely helped me feel better, more responsible, more critical, and more comfortable. Now – should I consider myself lucky to have attended so many ‘institutional’ programs in the past, which made me search elsewhere what they themselves hadn’t given me ? In every bad thing there is some good, right? Such kind of learning is one’s personal choice whatever way I try to look at it. It cannot be prescribed. And I don’t think it can really be evaluated. So in a way it’s no wonder it’s ‘officially’ accredited professional development that counts in the real world… even though it may not necessarily be as helpful as we’d like. It is more likely to open the way for pay rise, promotion, etc. So one needs to compromise, ‘waste’ valuable time doing things that ‘count’ to buy time to do things that ‘work’. I like seeing modeled what is being preached in CCK08. I’m a lurker, guilty of observing, following, but not responding much to threads. Much as I’m fascinated with this course (I do the readings, follow the Daily, check Google Alerts, also most of the recordings of discussions, but only on rare occasions drop a short comment on blog posts here and there). I can’t do better than this at the moment without neglecting something else that I can’t afford to or don’t want to neglect. As I’m writing this I realize I’m sticking to the ‘structural’ part of this connectivist course missing its ‘connective’ part. One can only connect efficiently to a certain point … it’s a matter of choosing priorities. Network combination is not additive ; networks share nodes, Valdis Krebs showed in week 3. And I guess the processing power and productivity of ‘us’ nodes too are not additive: when we make new connections, the power and productivity get distributed among the active connections. CCK08 is huge… its ‘connectivist’ part provides a lot of views for consideration, lots of ideas to digest, allows for a lot of possibilities to interact… it’s fascinating, serendipitous, but possibly scary when measured in time and short-term efficiency …a walk in the forest, the forest that knows . The structural part on the other way looks more like a highway to me, there are signposts showing the way, chosen by Stephen and George whose judgment I trust. It’s funny to think that it’s the non connectivist part of the Connectivism course that I have been sticking to so far – I wonder if time constraint is the only reason or is it perhaps that I’m the kind of the learner that needs some kind of a common base before being able to jump and swim in the ocean with the rest of the fish (and dolphins and sharks and the dead)? Is perhaps this common base most efficiently reached through traditional approach? Perhaps for some participants? Perhaps for me? I’m fine with the tools and technology used, it’s the theoretical part that is new to me. Can I reach this common base – my lacking (non-technology related) Prerequisite Literacies, perhaps more efficiently through traditional approach ? I don’t know… I’ve been happy sticking to the structural part so far (knowing I’m missing a lot of fun in the sideways tracks but also knowing I can’t afford to wander around much, and that I’m not sure I have much to add anyway). I cannot be everywhere, so I’ve constrained myself to the highway. I guess I’m an average reader, but a rather slow writer – English is my second language, but I don’t think I could have written much more if communication was in Slovene either. I think I’m taking CCK08 to see if I can make more sense of what happened to me back then when I started weaving my first connections. A whole new world opened up. I wonder if CCK will help me better articulate the directions I feel need to follow, personally, professionally, …directions that I feel help me do things well, or at least help me feel better at doing them…. Connectivism as a learning theory definitely resonate with me, can see it provide more room in the future for encouraging autonomy, diversity, individuality in class, in professional development, in general life… But much as I like being autonomous and free in the areas I like and feel comfortable in, I cannot function so everywhere. .. I see Connectivism as complementary to traditional learning. It’s good to be able to choose what works best for you in a given situation. After reading this in The Daily, it was much easier to create my CMap No.2 (not related to connectivism, basically my CMap notes for a staff meeting at school)… Working on my CMap No. 1 I too, like some other participants, wasn’t sure why there are 2 boxes to fill in when I try to link a new concept to the existing one… – one for the linking word showing relation between the two concepts and the other for the new concept. Ok, here’s my first CMap. Unfortunately the info added to individual concepts is not visible in jpg format… I did not attempt to answer week 1 questions, find it kind of difficult to talk about things I don’t know enough about… I’m listening to week 1 wrap up as I’m posting this to catch up a bit with the conversations elsewhere. I enjoyed the readings and presentations so far, preweek and week 1ones, here are some hands on tips concerning critical media literacy I liked and highlighted in Confronting the Challenges of Participatory Culture: Media Education for the 21st Century.